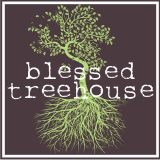 Blessed Treehouse: I still pinch myself . . .
. . . when I think, I have a daughter. So think how blessed I am. You and your daughter are both so beautiful. looooove this!!!!!!!! um, your dad is so precious. I'll pinch you if your sick of pinching yourself....j/k, you make the coolest best lookin babies ever! and a SUPER cute one, at that!